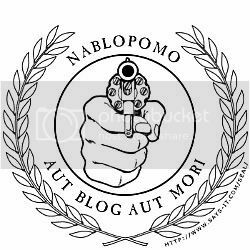 I decided to do NaBloPoMo (National Blog Posting Month). Basically, it's NaNoWriMo for those of us who aren't cool enough to do the real thing, and instead of writing a novel, you pretty much just update your blog every day. Which I do anyway. If I didn't have this cool new fake-Latin icon, I'd totally be making one that said "LAME." I think I'm a little late to do it officially (Damn you, Eric, for not getting your post about it in till after I went to bed last night! ), but oh well. Last night was fantastic. I did nothing. I watched the Veronica Mars from yesterday, and then really, nothing. I spent time with my dog, since I had been not hanging out with him as much recently. I thought about doing my laundry but didn't. I think I may have talked on the phone to a couple of people. And then I just did nothing. Fell asleep early. I've been getting cold lately. There was an episode of Grey's Anatomy with the girl who couldn't feel pain, and thats how temperature was for me, up until I was 18 or 19 years old. It's slowly progressed into me being cold CONSTANTLY. I wear a jacket at work pretty much all the time. I used to like the cold (because I didn't like the heat) and now I'm just upset that my AC is constantly on. It's expensive to live with someone who likes it cold, especially if they think you like it cold too.. because you assumed you did. I'm not making any sense. I should spider-web out my journal entries. Except then they wouldn't have that awesome stream-of-consciousness sort of feel. I <3 Stream of Consciousness, except sometimes I get way ahead of myself and I have to slow down the brain to be able to type. I'm going to pretend to work now.